Vishwambhar Kolekar from Belagavi has bagged two Gold medals at the State Olympics athletics meet being held at Dharwad and Hubballi. Over 4,500 athletes and over a 1,000 referees, nodal officials and technical assistants will participate in the event being held for the first time here. 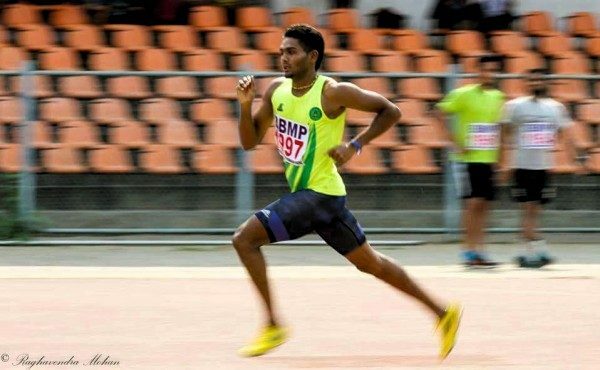 Vishwambhar Kolekar set a new games record as he clocked 1:47:5 Min : Sec : Ms in the 800 MTRS RUN – MEN (ATHLETICS). The old record was 1:50:4 Sec DAMODARA GOWDA -1986. Vishwambhar got his second gold 1500 mtrs Run with a time of 3:45:04 Min : Sec : Ms.